I’ve been very fortunate with my craigslist purchase experiences. The only little bump in the road was this small table. I hadn’t intended to purchase it at all, but it came along with another one that I really did want to buy. By the time I took this photo, I had already tried sanding and priming the tabletop. It was far more damaged than I realized and I had neither the tools nor the knowledge to repair the surface. The miracle of blogging intervened along the way and I witnessed many many before-and-after projects whose befores seemed far more pitiful than mine. Surely I could borrow some of the wonderful ideas in the collective consciousness of the bloggy world to make this table more useful and attractive. I’d give myself maybe a B- on this project. These photographs are very forgiving and since I’m not a stickler for perfection, I’m okay with the outcome. But in the spirit of full disclosure, it’s not perfect. I like the mildly scuffed edges, the vintage drawer pull with the paint chipping away to reveal the pretty glass beneath and especially the colorful city map decoupaged to the top. 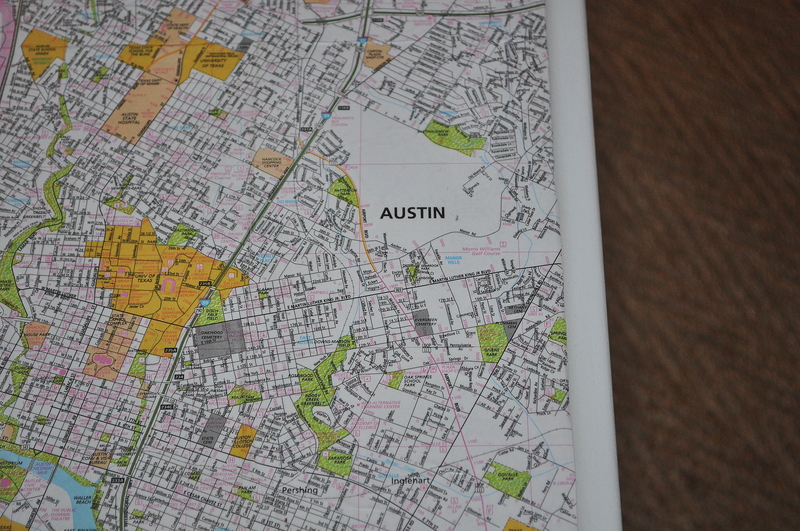 I used a street map for the city of Austin, Texas. There were two reasons that I didn’t use a Houston map: first, because I like artful look of the Colorado river twisting through the Austin map, and second, because Cristy wouldn’t let me cut up the only Houston map that we have. I think it turned out great! It’s such a big improvement! The map is really a cool touch. I’d call it a complete success! Oh, no, no, no, no, not a B- at all, Diane! No, dear friend…I give it a HUGE A+. And I mean it! It’s BEYOND faaaaaaaaabulous!!!!! OMG, it doesn’t even look like the same table. I am so impressed with your work! I love looking at your photos and peeking around your house because it’s so beautiful. You and Cristy have impeccable taste! Your home looks so comfortable and happy! Hope you had a super Thursday. You did an amazing job! A+ for sure! 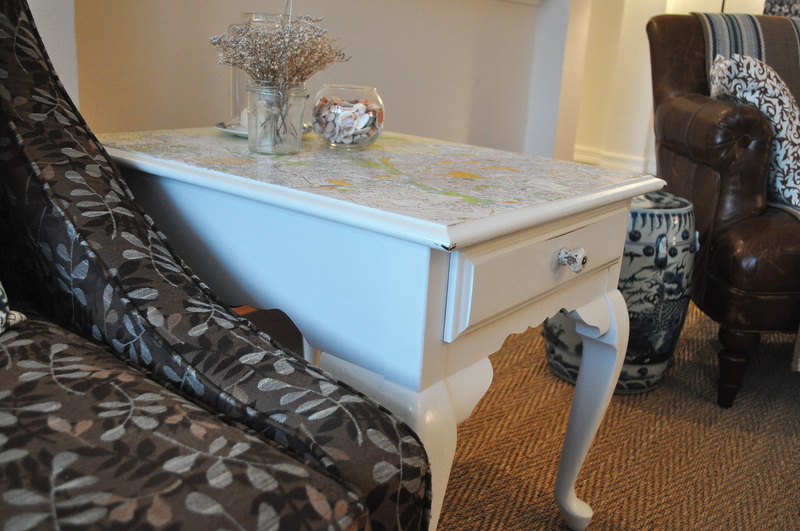 Love the decoupaged map! And that little table was screaming for a good coat of paint. Beautiful transformation! Thanks for sharing. WOW Diane! I absolutely love what you did with it! It looks fantastic, clean and pretty! Love this–the map is inspired. You are too hard on yourself! 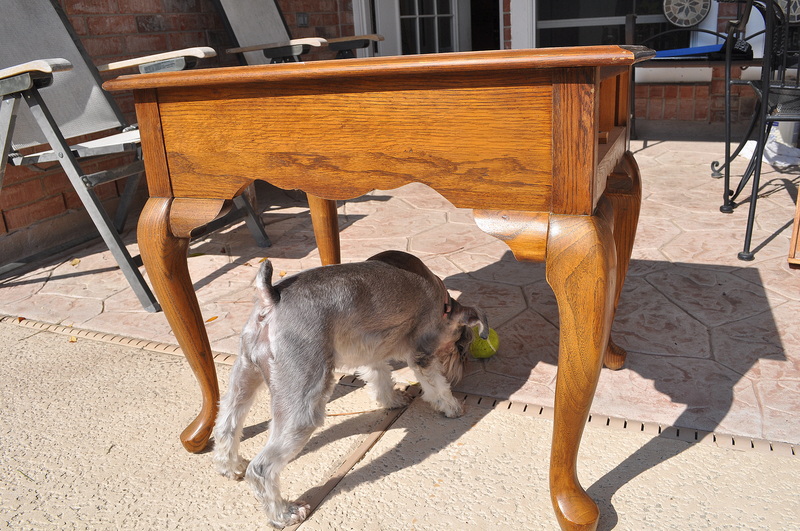 You know, this table was pretty before, pretty wood and pretty lines, but now it is so fun and has great personality! Well, I think it’s perfect. 🙂 I love the map idea. Did you mod-podge it on? Is there a protective covering on it or something? So curious! Great job! I think this looks fantastic! What are you talking about… a B- …?! pfft. It’s an A project. Fabulous makeover, I love it. The map idea is wonderful and I had to laugh at your comment about liking the way the Colorado River twists through Austin. Very clever indeed. Just so Very fun!!! Great transformation!! & I LOVE the chair/couch?? sitting next to it.. beautiful fabric. Wow! you wouldn’t think its the same table. You did a fantastic job with it. Love the color and the map is a nice touch. Well done. Hi Diann..thanks for joining the summer paint party. Please add my link or now the button that actually works. This is such a fun party and I hope you enjoy it. Beautiful transformation, I love it. I have the exact same table on my front porch! I painted it white about 12 years ago. She’s had a few touchups over the years, but she’s still going strong. I love your idea of putting the map on the top. I give it an A ,its fabulous! visiting from The Blog paint party, your my neighbor!. 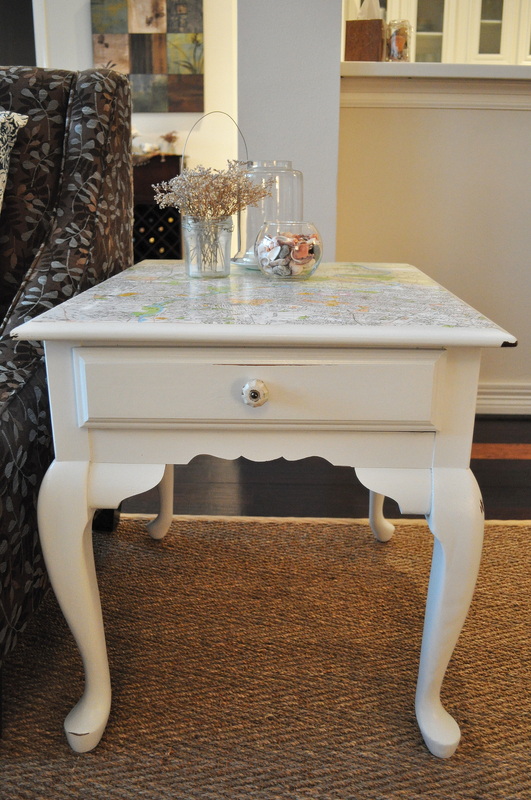 I have 2 almost identical end tables that hubby bought for $6.00 each and I have been thinking about painting them. Thanks for your inspiration as I have now decided that I need to paint those babies!! The table looks so updated and sweet. I know I’m a little late to the party, but this table is awesome. I love maps (esp. Texas ones!) and this is a great way to use them…I’m totally going to copy this when I find the right piece of furniture. BTW, I never thanked you for putting a link to my blog on your sidebar. I get a pretty decent amount of traffic from your website and I just want you to know that I appreciate it!